As a homeowner, you always want your house to look its best. However, it’s inevitable that your home will start looking dull and dingy after a few years. When that happens, you should consider hiring professionals for pressure washing services in Akron, OH. Don’t be tempted to buy your own pressure washer instead of getting expert pressure washing services in Akron, OH. Doing pressure washing on your own is inadvisable. For pressure washing services in Akron, OH that’s done right and with minimal property damage, contact Wilhelm Power Washing. We have been in business since 1973. Since we are staffed by highly capable and fully trained professionals, we’re sure to deliver top-notch work each time we’re called for pressure washing cleaning by Akron, OH residents. Before you attempt your own pressure washing services in Akron, OH, you should think about how DIY pressure washing stacks up against professional pressure washing services. Akron, OH residents, read on. It’s no secret that equipment for pressure washing services in Akron, OH use a ton of water pressure to clean off mud, mold, and mildew. Without proper knowledge of pressure washing cleaning, Akron, OH DIY pressure washers may seriously hurt themselves or their property. Lessen the chances of having an accident by hiring professional pressure washing services in Akron, OH. At Wilhelm Power Washing, we are all skilled and trained to do the job. 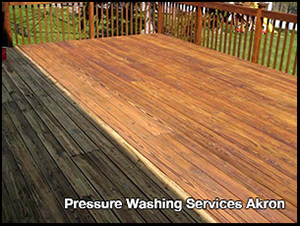 Our team always performs our pressure washing services in Akron, OH with utmost care. You can be sure that our pressure washing cleaning in Akron, OH makes your home clean without anyone getting hurt. If you conduct your own pressure washing services in Akron, OH, the equipment you’re using may not be as effective as the ones that professionals use. For example, if the machine you bought or rented has a pressure that’s lower than what is required, your DIY pressure washing cleaning in Akron, OH might only remove the surface-level grime on any surface. With our expert pressure washing services, Akron, Ohio residents can expect proper usage of equipment and chemical cleaning solutions. Pressure washing uses a lot of water and may involve the use of cleaning solutions. Professionals like Wilhelm Power Washing always ensure that our pressure washing services in Akron, OH have minimal impact. We use safe, environmentally friendly, and biodegradable materials for our pressure washing services. Akron, OH residents can rest easy knowing that their home looks beautiful at no cost to the environment. You have to invest a lot of effort when you insist on performing your own pressure washing cleaning. Akron, Ohio residents would have to research where to get the proper equipment and how to use it, as well as put in actual work. If you get professional pressure washing services in Akron, OH, you can just sit back and relax while our exceptional team does all of the work for you. Instead of stressing yourself out, you can just contact Wilhelm Power Washing for expert pressure washing services in Akron, Ohio. Expect us to do quality work every time. At first look, getting our professional pressure washing services in Akron, OH may seem expensive. That’s because you’re paying for the equipment and materials as well as the top-notch service from a team with more than four decades of experience. If you forego expert pressure washing cleaning in Akron, Ohio in favor of DIY pressure washing, you may end up paying more. Some of the costs may be the equipment, your water bills, or service fees. Get Professional Pressure Washing Services in Akron, Ohio Today! Getting pressure washing services in Akron, OH gives you professional results. Wilhelm Power Washing ensures that our residential and commercial clients get the best pressure washing services in Akron, OH. If you need pressure washing cleaning in Akron, Ohio, get in touch with us. Call 330-477-7094 to get a quote. As a property owner, you want the exteriors of your property to always look clean and presentable. However, no matter how much you try, it’s inevitable that your home or office will become filthy. With the passing of time comes an accumulation of dust and dirt, as well as the growth of mildew, mold, or moss. These contaminants will not only make your residential or company property look dirty but also expose you to health risks. Before you or anyone else gets hurt, you should turn to our well-know business, Wilhelm Power Washing. With our expert pressure washing and painting services, we ensure that your property will start looking as good as new. We are committed to your satisfaction and safety; as such, we only use top-of-the-line equipment, paint, and cleaning solutions for each of our jobs. Since 1973, Wilhelm Power Washing has been providing expert pressure washing and house painting services to both residential and commercial clients in Northeast Ohio. Our dedicated staff has more than 40 years of combined experience. In our years of service, our business has built a reputation for promptness, integrity, and reliability. No matter what job you called us for, you can expect us to be open and transparent with you every step of the way. At Wilhelm Power Washing, we specialize in pressure washing and house painting. When you hire us, you’ll be glad to find that our experts pay great attention to detail. We do our best to ensure that you get a quality job every time.